If you're looking for something a little different from your end-of-the-year charter, whisk your nearest and dearest to the Côte D'Azur, the Italian Riveria, Monaco or the Balearic Islands to enjoy fine cuisine, unbeatable landscapes and endless entertainment on board some of the best luxury yachts available for charter. 1. The Wellesley Explore the more rugged side of the Med this winter on board 56 metre The Wellesley, which can sleep up to 12 guests in six cabins with a crew of 12. Delivered in 1993 by Oceanco, she underwent an extensive refit in 2016 which included a seven metre extension. She boasts a luxurious beach club and a comfortable aft deck lounge, which is the perfect spot for sundowners after an al fresco supper. Her sundeck is the social hub and features a vast spa pool, sunpads and plenty of gym equipment. Below deck highlights include an opulent and ventilated cigar lounge as well as a spacious main saloon that adjoins to a TV lounge. Managed for charter by Thompson, Westwood & White, The Wellesley has a weekly winter rate starting from €220,000 in the low season and €260,000 in the high season. 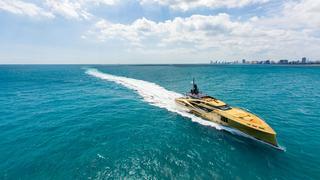 If you're looking for something a little different from your end-of-the-year charter, whisk your nearest and dearest to the Côte D'Azur, the Italian Riveria, Monaco or the Balearic Islands to enjoy fine cuisine, unbeatable landscapes and endless entertainment on board some of the best luxury yachts available for charter. Explore the more rugged side of the Med this winter on board 56 metre The Wellesley, which can sleep up to 12 guests in six cabins with a crew of 12. Delivered in 1993 by Oceanco, she underwent an extensive refit in 2016 which included a seven metre extension. She boasts a luxurious beach club and a comfortable aft deck lounge, which is the perfect spot for sundowners after an al fresco supper. Her sundeck is the social hub and features a vast spa pool, sunpads and plenty of gym equipment. Below deck highlights include an opulent and ventilated cigar lounge as well as a spacious main saloon that adjoins to a TV lounge. Managed for charter by Thompson, Westwood & White, The Wellesley has a weekly winter rate starting from €220,000 in the low season and €260,000 in the high season. The 61.8 metre RoMa boasts naval architecture and exterior design by Espen Oeino, featuring a generously sized sundeck complete with plentiful sunpads and a spa pool with a seated bar, while the lower decks offer spacious al fresco dining areas and lounges. Additionally, a fold-down swimming platform provides quick access to the water and another sunbathing area. A contemporary interior boasts a vast main saloon with white sofas and furnishings with accents of red, as well as an additional white-themed open plan lounge, bar and dining area with rich wooden floors. She also has a private cinema and a fully equipped gymnasium. Delivered in 2010 by Viareggio Superyachts, RoMa can sleep up to 12 guests in six cabins, which includes a full-beam master suite, with a crew of 17. 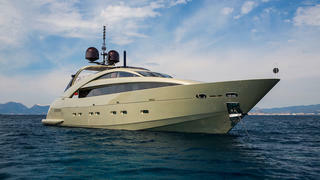 Managed for charter by Camper & Nicholsons, she has a weekly rate starting from €395,000. The 61.8 metre RoMa boasts naval architecture and exterior design by Espen Oeino, featuring a generously sized sundeck complete with plentiful sunpads and a spa pool with a seated bar, while the lower decks offer spacious al fresco dining areas and lounges. Additionally, a fold-down swimming platform provides quick access to the water and another sunbathing area. A contemporary interior boasts a vast main saloon with white sofas and furnishings with accents of red, as well as an additional white-themed open plan lounge, bar and dining area with rich wooden floors. She also has a private cinema and a fully equipped gymnasium. Delivered in 2010 by Viareggio Superyachts, RoMa can sleep up to 12 guests in six cabins, which includes a full-beam master suite, with a crew of 17. 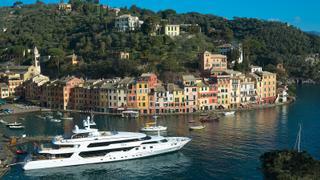 Managed for charter by Camper & Nicholsons, she has a weekly rate starting from €395,000. Spend an alternative winter season cruising around the Med on board 43 metre Go, sampling delicious local delicacies and warming tipples while listening to the lapping waves. She was delivered by Feadship in 2010 and refitted in 2015, and her bridge deck aft is well-protected against the breeze — ideal for hosting guests for a hearty supper. Each of the three decks boats an optional Bimini over the aft area, meaning guests can wrap up and enjoy a cocktail on deck regardless of the weather. Alternatively, guests can fire up the sundeck Jacuzzi to warm up with a glass of Champagne. Brave swimmers and water sports enthusiasts can also hang out on the fold-out swimming platform. Below deck, Go can sleep up to 10 guests in five cabins with a crew of nine. She boasts a full-beam master suite on the main deck as well as four guest cabins that can be converted into two VIP suites. Her cosy main saloon features large sofas and a dining area, while the walls are bedecked with contemporary art pieces. Alternatively, guests can relax in the modern skylounge, which is filled with natural light due to the vast windows. Managed for charter by Y.CO, Go has a weekly charter rate starting from €180,000 and is available in the Western Mediterranean all year around. Spend an alternative winter season cruising around the Med on board 43 metre Go, sampling delicious local delicacies and warming tipples while listening to the lapping waves. She was delivered by Feadship in 2010 and refitted in 2015, and her bridge deck aft is well-protected against the breeze — ideal for hosting guests for a hearty supper. Each of the three decks boats an optional Bimini over the aft area, meaning guests can wrap up and enjoy a cocktail on deck regardless of the weather. Alternatively, guests can fire up the sundeck Jacuzzi to warm up with a glass of Champagne. Brave swimmers and water sports enthusiasts can also hang out on the fold-out swimming platform. Below deck, Go can sleep up to 10 guests in five cabins with a crew of nine. She boasts a full-beam master suite on the main deck as well as four guest cabins that can be converted into two VIP suites. Her cosy main saloon features large sofas and a dining area, while the walls are bedecked with contemporary art pieces. Alternatively, guests can relax in the modern skylounge, which is filled with natural light due to the vast windows. Managed for charter by Y.CO, Go has a weekly charter rate starting from €180,000 and is available in the Western Mediterranean all year around. Relax forward in the large sundeck swimming pool on board the effortlessly glamorous 63.1 metre Irimari, or head aft to curl up with a book in one of the cocoon-like sunbeds. Enjoy a glass of red with friends aft in the main deck lounge or tuck into a hearty supper while watching the sunset. Irimari was delivered by Sunrise Yachts in 2015 and can sleep up to 12 guests in six cabins with a crew of 18. Her grand and contemporary master suite boasts a private lounge area stunning en suite with a vast freestanding bathtub. A chic main saloon features a lounge with large white sofas arranged around the flat screen TV, all of which sits adjacent to an elegant circular dining table for formal meals. Additionally, there's a huge upper deck TV lounge with a white piano in one corner and floor-to-ceiling windows, a private study and a water-level beach club with gym, sauna and a fold-out balcony. Managed for charter by Ocean Independence, Irimari has a weekly charter rate starting from €460,000 in the low season and €490,000 in the high season. Relax forward in the large sundeck swimming pool on board the effortlessly glamorous 63.1 metre Irimari, or head aft to curl up with a book in one of the cocoon-like sunbeds. Enjoy a glass of red with friends aft in the main deck lounge or tuck into a hearty supper while watching the sunset. Irimari was delivered by Sunrise Yachts in 2015 and can sleep up to 12 guests in six cabins with a crew of 18. Her grand and contemporary master suite boasts a private lounge area stunning en suite with a vast freestanding bathtub. A chic main saloon features a lounge with large white sofas arranged around the flat screen TV, all of which sits adjacent to an elegant circular dining table for formal meals. Additionally, there's a huge upper deck TV lounge with a white piano in one corner and floor-to-ceiling windows, a private study and a water-level beach club with gym, sauna and a fold-out balcony. Managed for charter by Ocean Independence, Irimari has a weekly charter rate starting from €460,000 in the low season and €490,000 in the high season. The 46 metre explorer yacht Pioneer is a brilliant option for discovering a different side to the Western Mediterranean this season. Enjoy a sunrise yoga session on the top section of the split-level sundeck before breakfast at the nearby dining table. End the day with a cosy al fresco supper in the aft deck dining area and sunset cocktails in the sundeck Jacuzzi. Her dark wood panelled main saloon boasts plush white sofas and armchairs, a drinks bar and a library lounge, perfect for relaxing with and entertaining friends on board. Stay fit in the on board gymnasium and indulge with lavish feasts in the elegant dining room. Delivered by Palmer Johnson in 1996, she was refitted in 2015 and can sleep up to 10 guests in five cabins, with accommodation for a crew of eight. 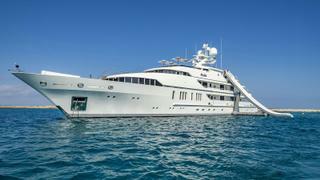 Managed for charter by Y.CO, Pioneer has a weekly charter rate starting from $120,000. The 46 metre explorer yacht Pioneer is a brilliant option for discovering a different side to the Western Mediterranean this season. Enjoy a sunrise yoga session on the top section of the split-level sundeck before breakfast at the nearby dining table. End the day with a cosy al fresco supper in the aft deck dining area and sunset cocktails in the sundeck Jacuzzi. Her dark wood panelled main saloon boasts plush white sofas and armchairs, a drinks bar and a library lounge, perfect for relaxing with and entertaining friends on board. Stay fit in the on board gymnasium and indulge with lavish feasts in the elegant dining room. Delivered by Palmer Johnson in 1996, she was refitted in 2015 and can sleep up to 10 guests in five cabins, with accommodation for a crew of eight. 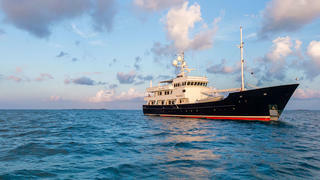 Managed for charter by Y.CO, Pioneer has a weekly charter rate starting from $120,000. Soak up those rays in the Western Mediterranean atop the golden hull of Khalilah. Stretch out on her foredeck sunpads or head to her sundeck to unwind in the Jacuzzi. Head to the main deck aft to enjoy a cocktail from the bar, or tuck into an indulgent al fresco supper with your friends and family. For a more casual dining spot head to the vividly decorated galley, where there is a seating area for guests. Delivered by Palmer Johnson in 2015, 49 metre Khalilah can sleep up to 11 guests in five modern cabins with a crew of nine. Relax with your nearest and dearest amid a myriad of artworks in her bright main saloon, which boasts a dining area, cocktail bar and office area. Managed for charter by Camper & Nicholsons, Khalilah has a weekly summer charter rate starting from €215,000. Soak up those rays in the Western Mediterranean atop the golden hull of Khalilah. Stretch out on her foredeck sunpads or head to her sundeck to unwind in the Jacuzzi. Head to the main deck aft to enjoy a cocktail from the bar, or tuck into an indulgent al fresco supper with your friends and family. For a more casual dining spot head to the vividly decorated galley, where there is a seating area for guests. Delivered by Palmer Johnson in 2015, 49 metre Khalilah can sleep up to 11 guests in five modern cabins with a crew of nine. Relax with your nearest and dearest amid a myriad of artworks in her bright main saloon, which boasts a dining area, cocktail bar and office area. Managed for charter by Camper & Nicholsons, Khalilah has a weekly summer charter rate starting from €215,000. Giraud (formerly known as Cacos V) is an exceedingly modern luxury yacht option for anyone wanting to cruise the Côte D'Azur in style. Stretch out on the bow sunpads on the upper deck and watch the sunset with a glass of Champagne, or head up to the sundeck to take a dip in the raised Jacuzzi. Moving aft, you'll find al fresco dining for 12 — the perfect spot for a languid tapas lunch in the sun — and a very spacious lounge area to relax in afterwards. Her sophisticated interior features an upper deck cocktail lounge complete with bar and seating, as well as a futuristic main saloon and dining area that has so many beautiful sculptures the room wouldn't look out of place in the MoMA. Each of her cabins has a feature wall with a colourful mural, and the superyacht also boasts artistic flair throughout her corridors and walkways. 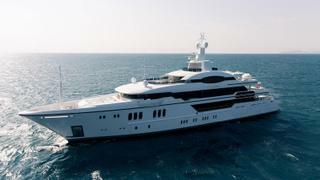 Delivered in 2013 by Admiral Yachts, 40 metre Giraud can sleep up to 12 guests in five cabins with a crew of nine. Managed for charter by bluewater, Giraud has a weekly charter rate starting from €180,000. Giraud (formerly known as Cacos V) is an exceedingly modern luxury yacht option for anyone wanting to cruise the Côte D'Azur in style. Stretch out on the bow sunpads on the upper deck and watch the sunset with a glass of Champagne, or head up to the sundeck to take a dip in the raised Jacuzzi. Moving aft, you'll find al fresco dining for 12 — the perfect spot for a languid tapas lunch in the sun — and a very spacious lounge area to relax in afterwards. Her sophisticated interior features an upper deck cocktail lounge complete with bar and seating, as well as a futuristic main saloon and dining area that has so many beautiful sculptures the room wouldn't look out of place in the MoMA. Each of her cabins has a feature wall with a colourful mural, and the superyacht also boasts artistic flair throughout her corridors and walkways. 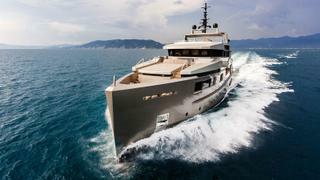 Delivered in 2013 by Admiral Yachts, 40 metre Giraud can sleep up to 12 guests in five cabins with a crew of nine. 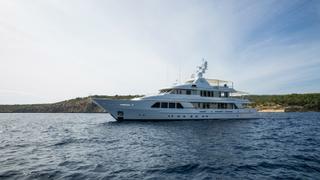 Managed for charter by bluewater, Giraud has a weekly charter rate starting from €180,000. The sleek, white gold-coloured exterior of 37 metre Midnight Sun is enough to turn heads in any port when cruising in the Western Mediterranean this year. Relax on her sundeck and enjoy panoramic views of your surroundings from her circular Jacuzzi or simply sit back on the U-shaped sofa aft of a casual dining table. Two sweeping staircases lead down to the main deck where there’s a sunpad island and a lounge area. Below deck, Midnight Sun can sleep up to 10 guests in five elegant cabins, with a full-width split-level master suite stealing the show. An open-plan saloon has a leather-clad cocktail bar, two small breakfast tables and a TV lounge area with a comfortable corner sofa. Delivered by ISA in 2006, 37 metre Midnight Sun is managed for charter by bluewater and has a weekly charter rate starting from €88,000. The sleek, white gold-coloured exterior of 37 metre Midnight Sun is enough to turn heads in any port when cruising in the Western Mediterranean this year. Relax on her sundeck and enjoy panoramic views of your surroundings from her circular Jacuzzi or simply sit back on the U-shaped sofa aft of a casual dining table. Two sweeping staircases lead down to the main deck where there’s a sunpad island and a lounge area. Below deck, Midnight Sun can sleep up to 10 guests in five elegant cabins, with a full-width split-level master suite stealing the show. An open-plan saloon has a leather-clad cocktail bar, two small breakfast tables and a TV lounge area with a comfortable corner sofa. Delivered by ISA in 2006, 37 metre Midnight Sun is managed for charter by bluewater and has a weekly charter rate starting from €88,000.